The Wild at Heart Legal Defense Association is dedicated to advocating for the public interest, by which we mean the interest of humans, other living species, and the whole environment. We hope that through our litigation and advocacy of the legislature and the executive, we may promote justice across generations and a sustainable economy through the prevention of unsustainable economic and land policies. This report addresses Section 181 of Article 47 and the section concerning nuclear facilities of Taiwan’s First Report to the International Convention on Civil and Political Rights (hereafter the Report). This report concerns the right to life in Article 6 of the ICCPR and the right to health in Article 12 of the International Covenant on Economic, Social, and Cultural Rights (ICESCR), and the right to self-determination in the first article of both conventions. We believe that the Report oversimplifies the actual conditions of nuclear safety in Taiwan, stating simply that “the government should take incidents such as the Fukushima Nuclear Disaster as cautionary examples and carry out complete nuclear physical examinations, strengthen coordinated response capabilities in the event of a natural disaster, and establish emergency response crew measures, taking all possible steps to prevent a serious and uncontainable nuclear incident.” However, despite aging nuclear facilities and Taiwan's nuclear plants being situated in geologically unstable areas that are frequently visited by earthquakes, tsunamis, volcanic activity, and other high-risk geological events, there has been no response to inquires about the frequent mishaps in operation, or what measures will be taken to ensure the safety of Taiwanese citizens' lives, health, and property in the event of a nuclear disaster. Like Fukushima Island, the location of the 2011 Japanese nuclear disaster, Taiwan is situated at the juncture of the Philippine and Eurasian Tectonic Plates. Islands along this geologically active seabed bulge frequently experience high-magnitude earthquakes -- from 1991 to 2006, there were an average of 18,500 earthquakes per year, with 49,919 in 1999 alone. There are fault lines near all four of Taiwan's nuclear plants. Chinshan and Kuosheng plants are located near Mt. Datun, a dormant volcano, and the Lungmen plant is exposed to the activity of 70 underwater volcanoes, with geologists warning that volcanic eruptions are a potential threat to nuclear safety. In 1867, the Keelung-Chinshan Tsunami -- the most deadly in Taiwan's recorded history -- affected areas dangerously close to the present-day locations of the Chinshan and Kuosheng plants. In 1771, 85-meter-tall waves inundated Japan's Ishigaki Island, 200 kilometers off Taiwan's northeastern coast. Taiwan's Ministry of Economic Affairs notes in its Central Geological Survey that faultline and underwater volcano activity is expected to accompany the observed expansion of the oceanic trough northeast of Taiwan, making tsunamis a likely occurrence in the area. This is of great concern because geologists believe that tsunamis pose a serious threat to nuclear plant safety. The Chinshan and Kuosheng plants are also located along the potential path of rock- and land-slides. In short, the vulnerability of Taiwan's nuclear plants to frequent earthquakes, tsunamis, and faultine and volcanic activity, make nuclear disaster a real and serious danger. There are three nuclear plants within the Taipei metropolitan area. Of these, the Chinshan and Kuosheng plants are within 30 kilometers of about 4,700,000 and 5,500,000 residents, respectively. It is nearly impossible to evacuate and shelter everyone in such a populous area. Taiwan's total land area is only 36,000 square kilometers; the 160,000 square kilometers affected by the Chernobyl disaster is 4.4 times the total area of the entire island of Taiwan -- in the event of a nuclear disaster, Taiwanese residents would have no means of escape. While all people within a 30 kilometer radius of the Fukushima and Chernobyl nuclear disasters were evacuated, Taiwan's “emergency planning zones” include only those within an 8 kilometer radius of each nuclear plant. According to information from Taiwan's National Nuclear Emergency Response Center, the entire island can provide refuge for around 1,060,000 people. This figure includes shelters in areas where the outdoors is deemed unsafe due to nuclear fallout; without these, only 638,000 people can be accommodated -- the island's capacity to actually provide shelter for those within the 30 kilometer radius of the nuclear plants is therefore seriously deficient. The Xizhi Baochangkeng Training Center the government plans to use as a shelter is within 14 kilometers of the Kuosheng plant and 25 kilometers of the Chinshan and Lungmen plants -- well within the evacuation zone area of other countries that have experienced nuclear disasters, presenting a serious threat to the right to life and health protected by the Conventions. At the time of the Fukushima nuclear disaster, running water in Tokyo, 250 kilometers away was found to have levels of radiation high enough to be dangerous for consumption by pregnant women and children. All of Taiwan's major reservoirs and dams are within 250 kilometers of at least one nuclear plant. Of these, the dams of Shimen, Xinshan, Feicui, and Mudan Reservoirs are all within less than 75 kilometers of one or more nuclear plants; the areas covered by the reservoirs themselves fall even closer. In a nuclear disaster, Taiwanese citizens will face not only danger from radiation, but also a shortage of potable water, which together would be a most serious violation of their rights to water, a reasonable standard of living, and the highest attainable standard of health. Deterioration and aging facilities are a serious issue at all three nuclear plants in operation in Taiwan. The first reactor at the Chinshan plant began commercial operation in December of 1978 and the second in July of 1979; the first Kuosheng plant reactor began in December 1981 and the second in March 1983. Over more than 30 years of operation, cracks have appeared in the core shroud of all four reactor units, but none have been replaced, reportedly due to cost; to date, a broken screw bolt anchoring the second reactor at the Kuosheng plant has still not been properly attended to; and broken pipes leaking transformer oil have at one point ignited a large fire at the Maanshan plant. The construction of the Lungmen plant has been fraught with contention from its beginning on March 17, 1999. Because the plant was not built on a fixed-price or turnkey model but instead divided into 853 separate projects, project integration has been cumbersome. Changes to the original plant design have resulted in reduced safety standards; the construction site workers receive frequent sanctions from Taiwan's Atomic Energy Council; a member of the safety inspection committee who has participated in inspections of the Lungmen plant has publicly published misgivings about the plant's construction; critical areas of the plant exposed to radiation use electrical wiring not resistant to radiation, and one contractor involved in the construction of the plant has said that the plant is likely to explode once it begins operation. During a trial run, the plant was repeatedly flooded due to a combination of human error, flaws in equipment, and a typhoon; everything from warm temperatures, static electricity generated as the control equipment was being cleaned, to condensation on rainy days have resulted in electrical outages and fires. 1. Taiwan's Basic Environment Act explicitly declares that becoming a nuclear-free country is a national policy goal, why do we need concrete measures and timetables? Instituted on December 11, 2002, Article 23 of Taiwan's Basic Environment Act states that: "The government shall establish plans to gradually achieve the goal of becoming a nuclear-free country." In the ten years since the law's passage, there have been no measures passed with respect to this Article to protect the health and safety of Taiwanese citizens. 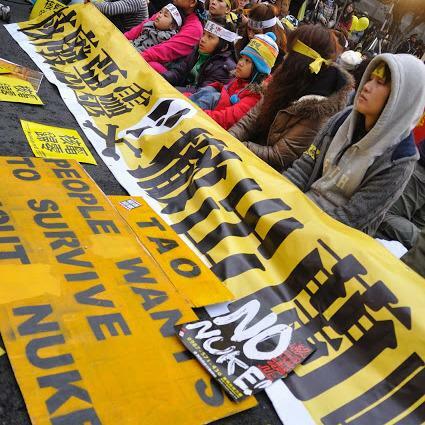 The Taiwanese government has reiterated this intention in its National Report, stating that the government should "create conditions toward winning the agreement of anti-nuclear energy advocates and to achieve "progressive advancement toward becoming nuclear-free"" Therefore, we should request concrete measures and timetables. 2. Nuclear energy makes up only 12.4% of total energy used by Taiwan, much lower than the amount available in unused energy reserves. Given that we have decided as a nation to work towards becoming nuclear-free, why are we unable to shut down the Chinshan, Kuosheng, and Maanshan nuclear plants, or stop construction of a fourth? According to 2012 statistics from Taipower, nuclear power only makes up 12.4% of Taiwan's energy usage; the capacity of reserve energy was 22.7% of peak usage last year. Even at times of peak usage, the amount of unused reserve energy was greater than the amount of nuclear energy used. From April 23 to May 3 of 2012, energy production temporarily decreased at the Kuosheng and Maanshan plants as equipment at both was overhauled. Even with the resulting 38% reduction in nuclear energy, there were no electricity shortages in Taiwan. As stated above, earthquakes in Taiwan are common, nuclear power plants are in zones prone to tsunamis and landslides and in close proximity to fault lines and volcanic activity besides. They are located near the populous capital, inviting disaster in case of a nuclear accident as Taiwan's land area is limited and lacks spaces for taking refuge. Nuclear plants are near important reservoirs, meaning that during normal operations there is a risk of contamination by radiation and in the case of a nuclear accident, there will be a shortage of water safe for human use. Furthermore, the Chinshan, Kuosheng, and Maanshan plants currently in operation suffer from deterioration of their facilities, and there are also serious engineering issues with the fourth plant now under construction. It is therefore imperative that we take swift and decisive action to close three operating plants and halt construction on the fourth to make Taiwan a nuclear-free country before a nuclear disaster occurs. 3. The radius of the Emergency Planning Zone surrounding each plant should be widened by at least 30 km, and plans for emergency measures made for the protection of those nearby in the case of a nuclear accident. Before the complete closure of all existing nuclear plants, the present 8 km radius of their Emergency Planning Zones should be widened to 30 km, iodine tablets and nuclear disaster preparedness training should be provided to those who would be affected, and an emergency plan for the protection of people's health and safety should be set forth immediately. If it is found that no actionable plan to deal with a nuclear accident or to resettle affected residents is feasible, the case for closing down the existing plants is all the more urgent. All sources used to compile this report are in Chinese, from either Taiwan Power Company (Taipower) or government sources unless otherwise indicated. Sophie Chen Jin is a member of the staff at Wild at Heart Legal Defense Association.